Dhadak is the sound of a heartbeat in your chest. Specifically, it is used to refer to the special heart beats that come when you think of the one you love. 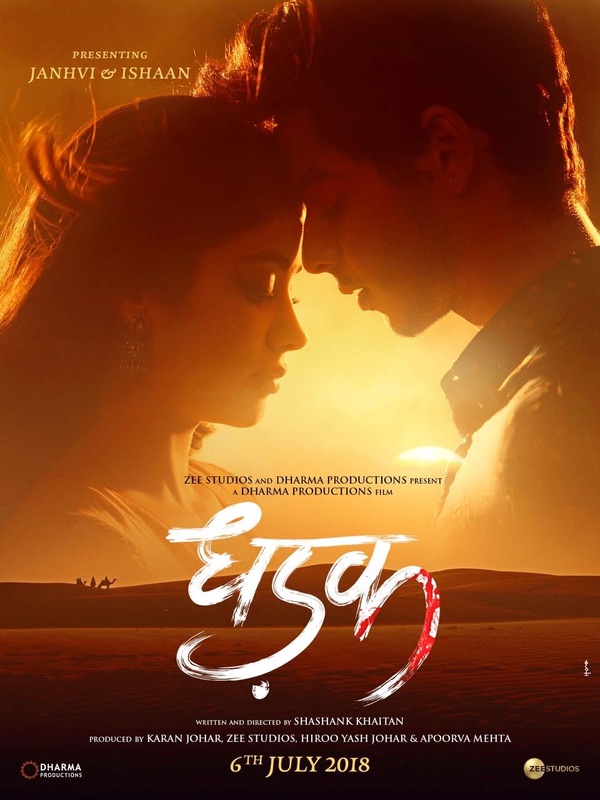 Thus, the new film Dhadak is a classic love story produced by Karan Johar. A remake of the Marathi hit Sairat, it’s both romance and tragedy with new stars Ishaan Khatter and Janhvi Kapoor in the lead roles. Its music is given by Ajay-Atul, music directors who are full of experience in the industry as arrangers and have also brought those skills into creating soundtracks in the last few years. Fittingly, the album opens with the title track Dhadak. High and low violins play backed by other soft notes. A piano provides melody to give backing to Ajay Gogavale’s smooth if soft vocals. Easy on the ears, there is a flow in its sound. The clip on Youtube shows Ishaan running for his love, to only grab glimpses of her as he goes through the back streets. Shreya Ghosal provides the girl’s side in this with only an earthen pot to back her and delivers her usual high-quality sound. The song pulls at heart strings, the clip makes the audience urge for Ishaan’s victory but there isn’t anything in this song that is different from so many others in this style and genre. Ajay Gogavale takes to the mic again for Pehli Baar. The feel of anticipation, the light hearted but staccato rhythms, the smoothness of the voice is all there. This is a boy in love who wants nothing more than to gaze upon his love. Violins and a flute take up most of the backing here but there is a brief block of more traditional village instruments to break things up a bit. While it is also a beautiful song that tugs at heart strings, it could have come straight out of a Raj Kapoor film… its timeless and thus lacks any spark of modernity. For the next song Zingaat, Ajay joins up with Atul to deliver a fast-paced jazzy song. A very repetitive, very loud and heavy beat from traditional drums makes this the fun song in the album. This could easily be at a wedding or other celebration and nothing in the lyrics or instrumentation gives this away. Its certainly a major change from the previous two songs but otherwise fails to do anything on its own. The final song for this short album is Vaara Re. Ajay also rounds off the album with another go on the mic. This is more of a sad tinged tone, more chorus and low flute. However, its opening and lyrics are more towards finding joy in time. There is a nice touch with the sitar giving it some difference from the other songs. But overall the tone is of loss and while it may not bring tears to the eyes, there is no less a feeling of penalty having been paid. Dharma Productions has taken an old-time love story and Ajay-Atul have given it an old-time soundtrack. While this is not a bad thing, especially for audiences who just want a simple story and a spot to get away from real life for 2 or so hours, what it really means to the album is that there is no spark in it to make it great on its own. Possibly within the film itself it will have a lot more impact but with just 4 songs, 3 of which seem to be on the same topic with more or less use of minor scales, its hard to give this a high rating. 15 queries in 0.603 seconds.